At the hobby store they sell different bits of terrain. The stuff below is used for fields, or wild flowers, or tree canopies. It is long and stringy like cotton. 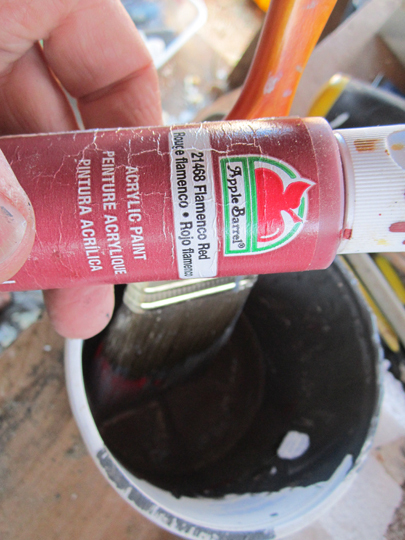 Dab your glue and water mixture on the landscape and press a small tuft of this stuff in place. Shape and manipulate with a toothpick or sculpting tool. 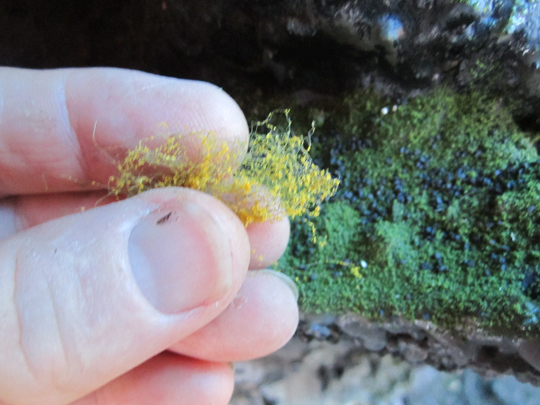 It can be pulled really thin and sparse or left in heavy clumps. That is how it can look very sparsely placed. 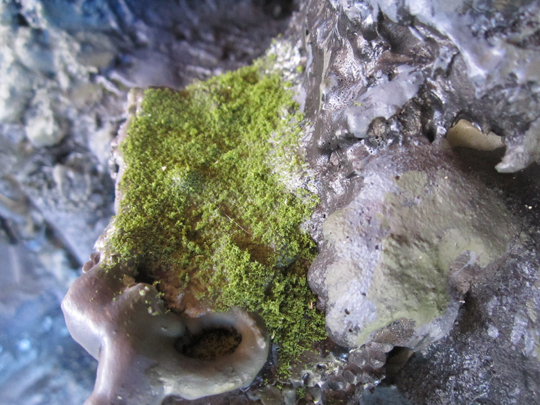 The color breaks up the patches of green. You can find lots of different colors. The more you use the more realistic it can look if you do it correctly. In your mind, figure out what kind of plant you want this to simulate. Decide what kind of growing conditions it would need. For instance, let’s assume this is a yellow plant that needs full sun and some water to survive. Now you can look around your set for places that these conditions exist and place your plants there. As you plant your landscape, imagine where water would collect, where runoff would come down the mountain, where seeds would collect, etc. It doesn’t matter what rules you follow, just be consistent throughout your project. The whole goal here is to convince the brain that this is real somewhere and not painted styrofoam. The mind starts off filled with disbelief that it is real. We are trying to “suspend the disbelief”. We are trying to convince the viewer’s brain to let go of some of that disbelief. We can see a whole scene and we can believe it is real. But if we notice something that is not right, or doesn’t follow the rules, then we immediately fill our brains with disbelief, and the illusion is ruined. 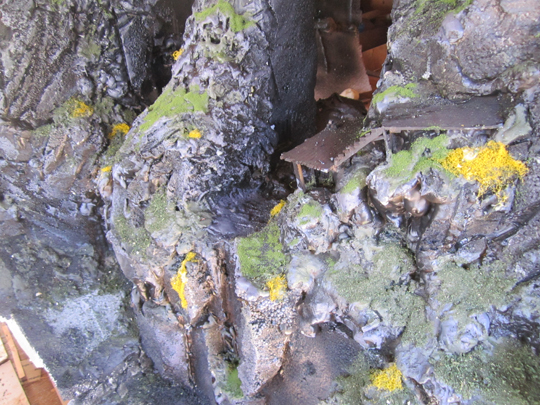 For example, if the entire set is filled with yellow plants that live in the sunny areas, then in one spot we find them in dark shade, that might be enough to cause us to not believe any more. You won’t ever get it perfect, but if you make some rules, and stick with them you will have a much better chance to fool your viewers. Go ahead, plant some sunny yellow flowers, make a mess, have some fun. Let’s take another look at realistic planting of the grass. See that image? Cool huh? I decided to plant the grass on the flat areas. The steep rock areas won’t hold dirt. Without dirt the grass won’t catch. You can see a few areas down the cliff face that some lucky patches of grass grabbed hold. This is already probably film ready for a quick fly by locator shot. It is just some foam, painted black, drybrushed gray, and red. Then a few sprinkles of green grass. I still have multiple layers left to go but already the magic is showing through. With practical models like this, the shadows and highlights are always perfect. There is no way to screw them up. Real light hits it and you get real shadows and highlights with no work. 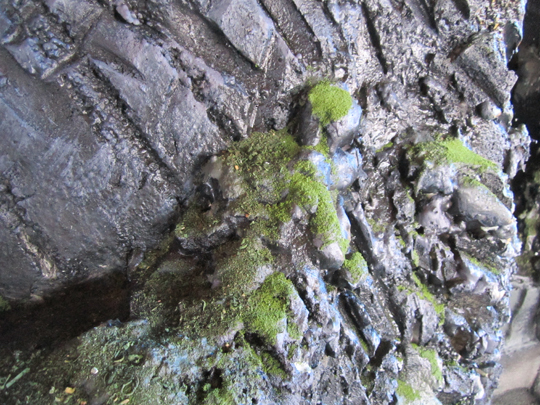 A few flat areas down the cliff face collected some dirt, and some grass began to grow. Keep taking some photos to see how things look in your camera. See how the cliffs look great but the bridge is one block of color? We will have to work on that. Next we will add some other plants. So by now most of the drybrushing paint has been applied. Now for some fun stuff. 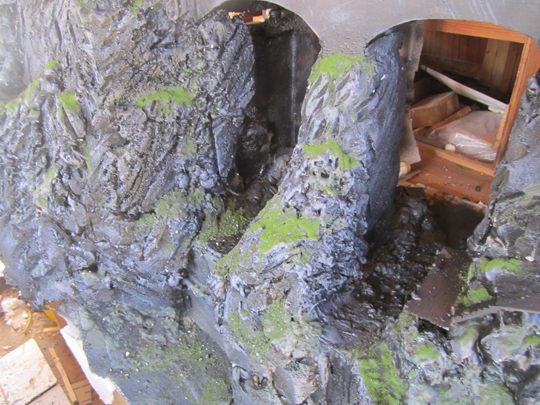 The hobby store/train store sells terrain elements from a company called Woodland Scenics. They are jars of grass, bushes, trees, gravel, etc. This is a fine grass medium. 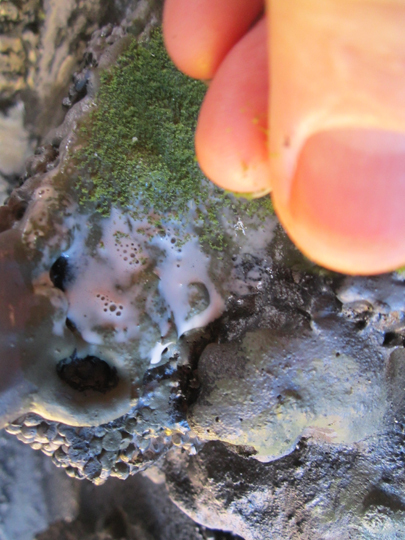 Grab some white glue, throw a blob in a dish and add some water. Stir until the glue dissolves. 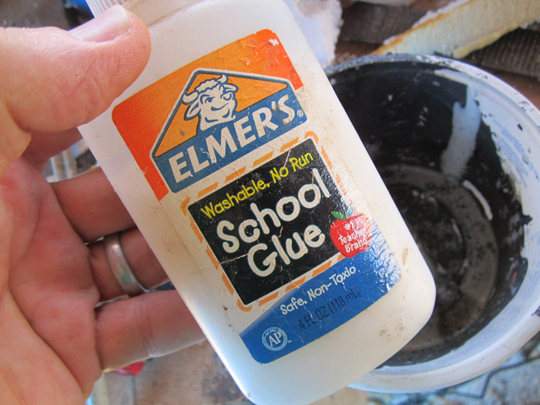 I have used tacky glue, and also Elmer’s glue. You need something that dries clear and will dissolve in water. You can make it thick or make it thin depending on where you are going to apply it. I use a brush to dab it on. 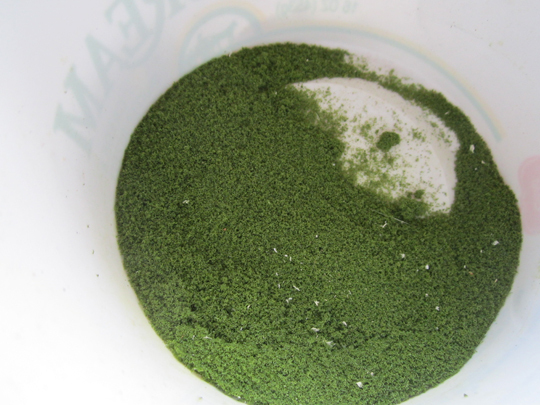 Then I sprinkle some green grass particles. 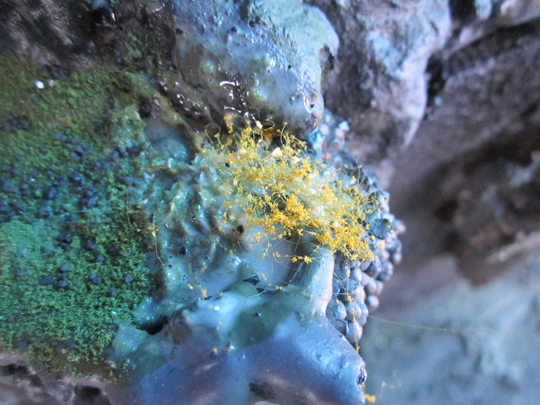 The particles will stick to the glue. Any excess glue will dry clear. You can always go back and add more later. See ? magic grass patch. They sell different colors and textures. 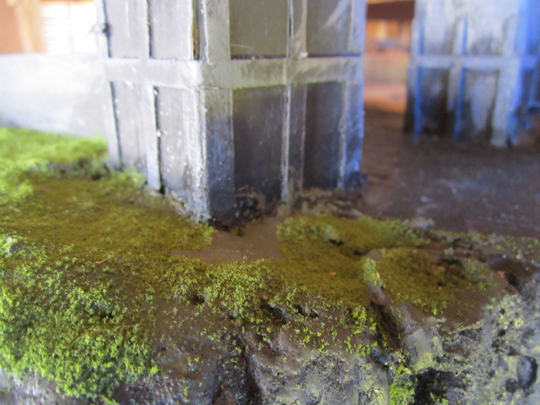 Remember to only add glue where you want grass to be. Grass grows on pretty horizontal areas. If you have a rock that is super steep, grass or plants are not as likely to land there and grow. 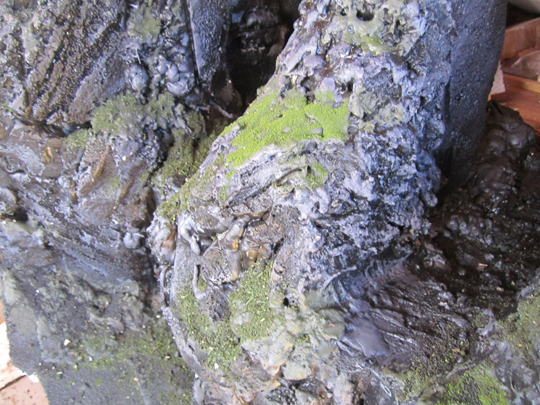 In the steep areas, you can leave bare rock showing through. 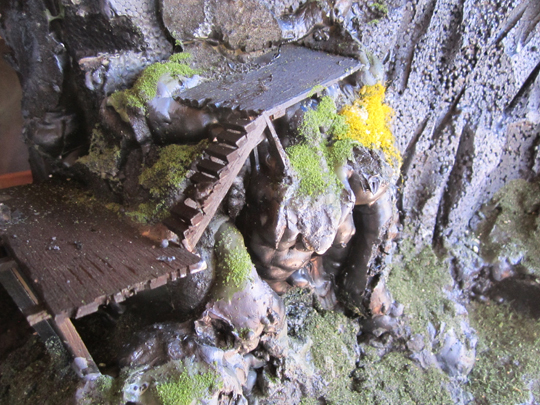 If you don’t have access to the Woodland Scenics products you can make your own. 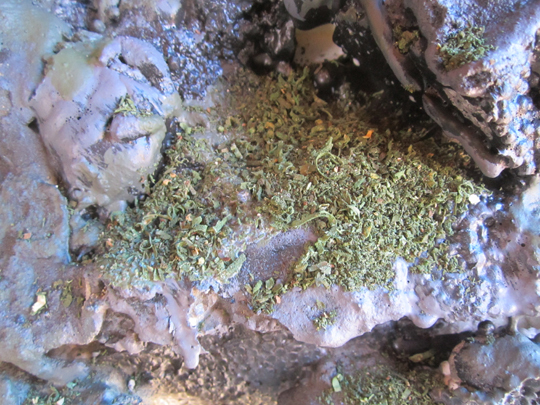 The above photo is sawdust that was thrown in a bucket with some green paint. Stir it all around, then set it out to dry. You can even microwave it in small time chunks to help dry it out, or place in a shallow pan in the sun. 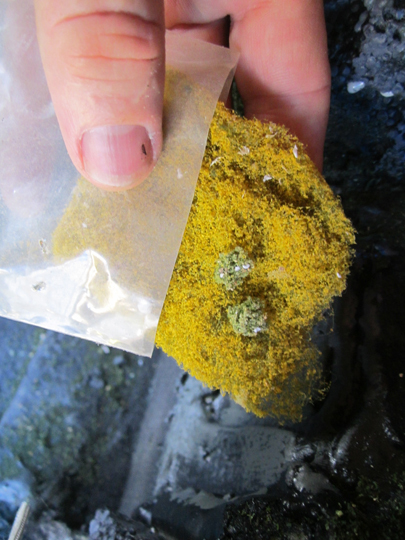 Once dry, store in an airtight container. They also sell black and white gravel. 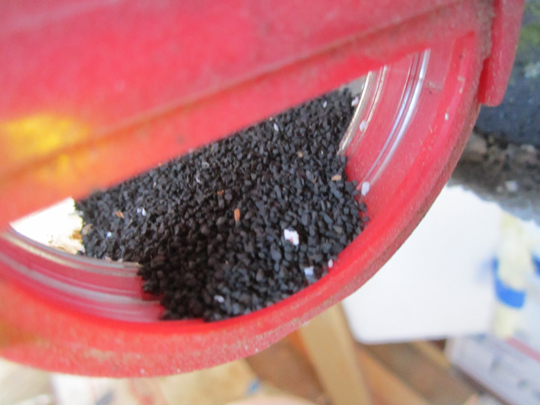 I will add some black gravel in the same manner. A little tip for you: if you add a few drops of dishwashing detergent to the glue/water mix it will cut the surface tension and allow the glue mixture to sink quicker into the grass. 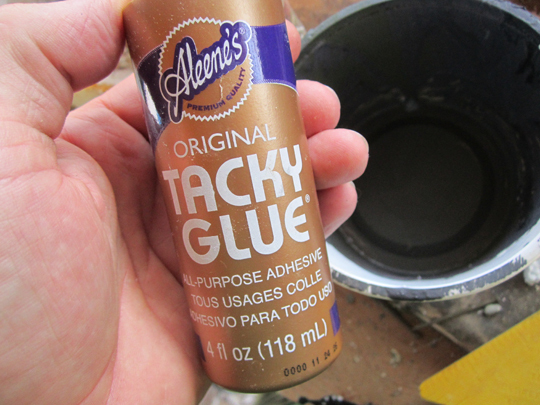 You can also put your watery glue mixture in a spray bottle and spray it on. You can even spray lightly over existing grass to help seal in any loose bits later. See the magic yet? Take it slowly and be precise with your vegetation planting. Make sure it makes sense where you place it. If you decide your vegetation needs water then place it where the landscape would receive water if it was real. Now this looks good enough already to start filming. But the more layers you add the more realistic it will be. It is up to you to determine how many layers of different vegetation you desire. Go ahead, play landscaper, have some fun. 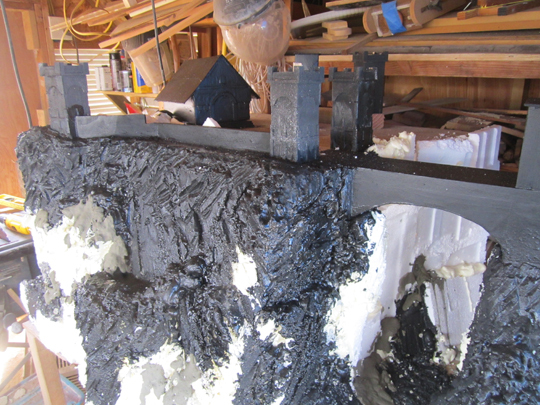 Once your styrofoam is in place and you have shaped it, then paint the whole thing black. I did most of it with a brush and it works fine. But I remembered that I had an air sprayer. 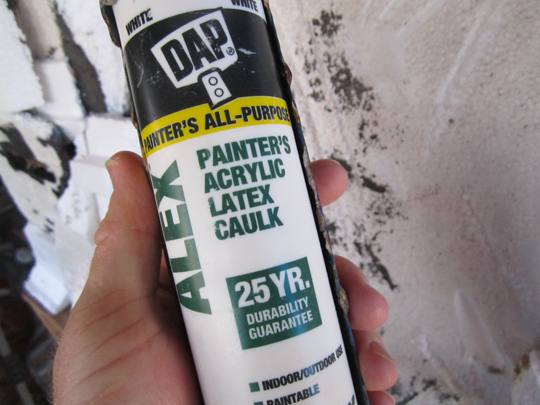 Now, you can not use spray paint to paint bare foam. 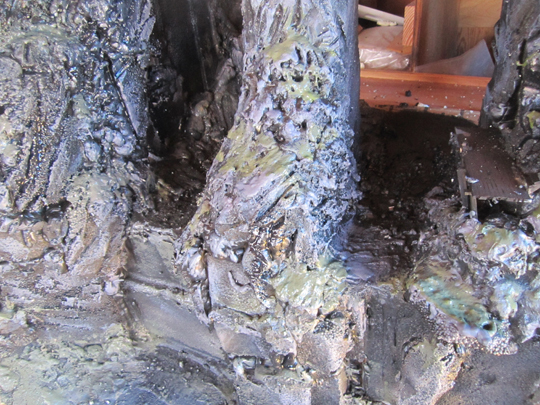 The propellant in the can will melt the styrofoam. 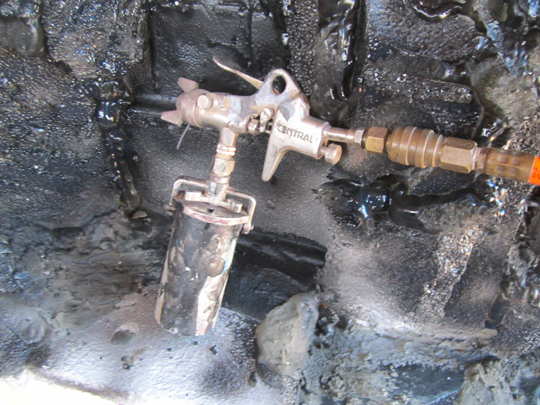 But you can pour some regular paint into a paint gun and spray it on like that. This sprayer was like $20 years ago at Harbor Freight hardware. It is designed to paint cars. It hooks up to my air compressor. An airbrush would have worked the same way. 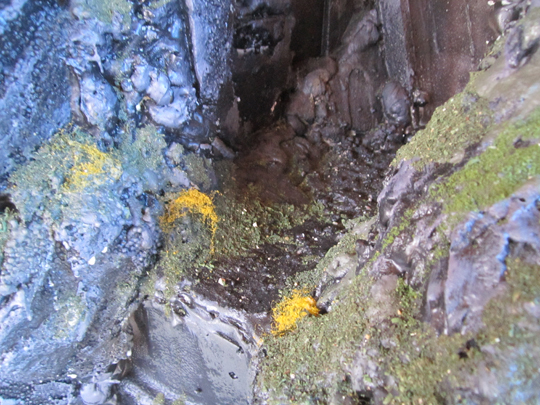 It helped to spray paint into the cracks and crevices. 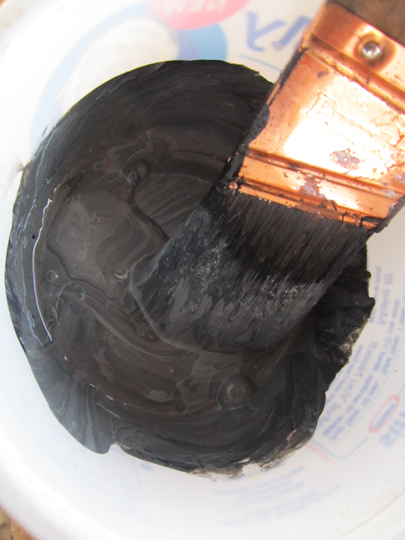 Once it is all black, I mixed up a bit of dark gray paint. I grabbed a stiff bristle brush and drybrushed some gray onto the rocks. Brush lightly, hitting the highlights, leaving the dark shadow areas black. Slowly bring up the highlights. It will suddenly look more like rock. But don’t worry, you won’t really see the magic until the very last minute. 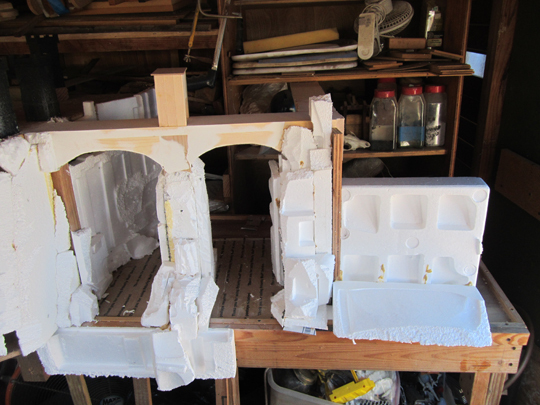 Through out the entire project all you will see is styrofoam and paint. Eventually enough layers will go on and your mind will stop seeing bits of the project and will finally see the landscape. Don’t give up yet. Next I added some red paint into the gray mixture. 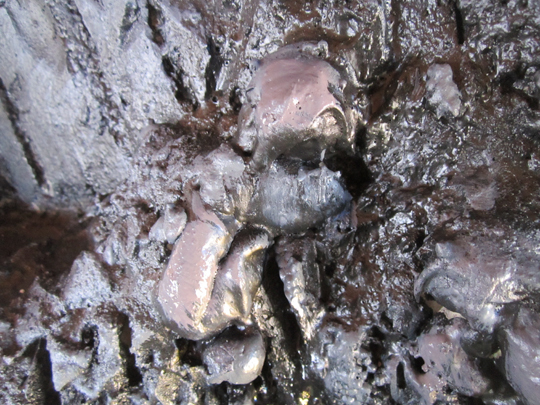 Rocks are different colors, not just one shade of gray. 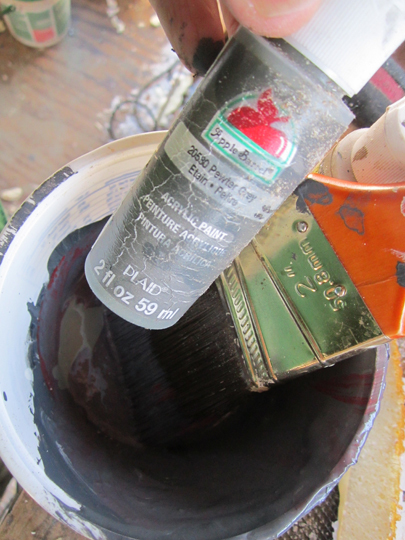 I added the red right into the paint bucket of gray paint. Drybrush it lightly on. Leave the blackest shadows intact. 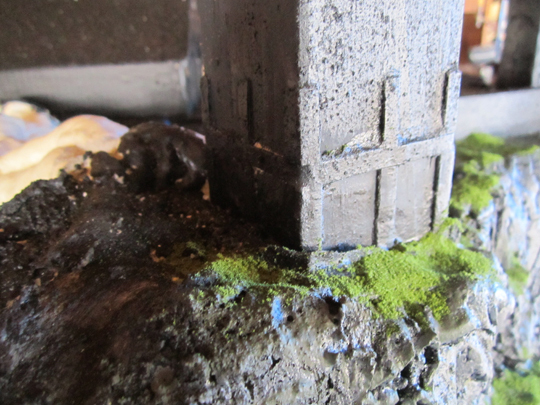 Once the basic rock is painted, I added some green where moss/grass would grow. Imagine dropping grass seeds from the sky. Pick out flat horizontal spaces and dab some green. Dab on some small spots of grass color. This is a little more precise than the other colors. Only add it where plants would grow. We will add grass later, but the paint will help the illusion. Go ahead, make a castle, have some fun. 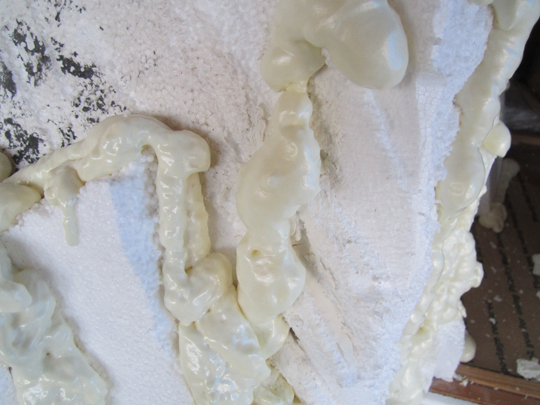 Add some more styrofoam to bulk up your basic rock shapes. Add to fill in holes, and to create shapes. Keep building. The more you can add at this stage, the easier it will be later. 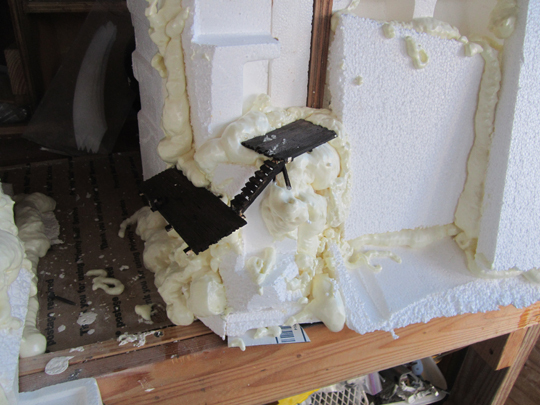 It is easier to have too much foam and cut some off than it is to have too little and have to add later. 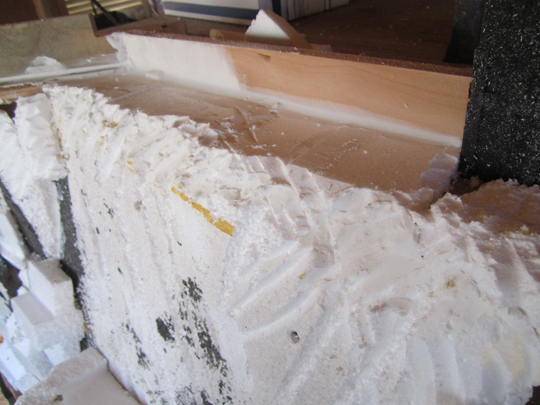 Once it is bulked out, you can begin to shape the foam with knives, cutters or abrasives. These marks are made with a drywall saw. 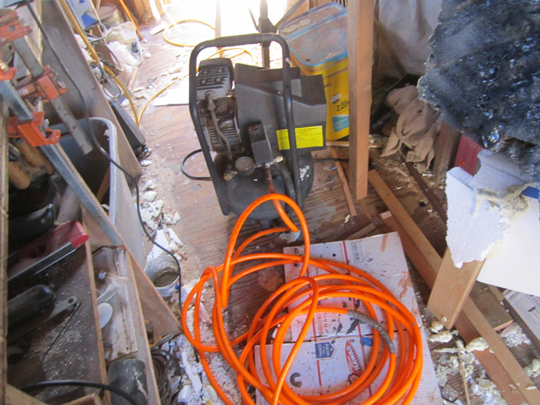 Remove any flat factory surfaces. 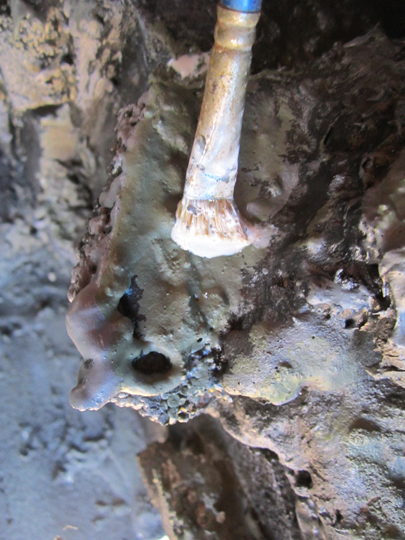 I fill some small cracks with painter’s caulking. 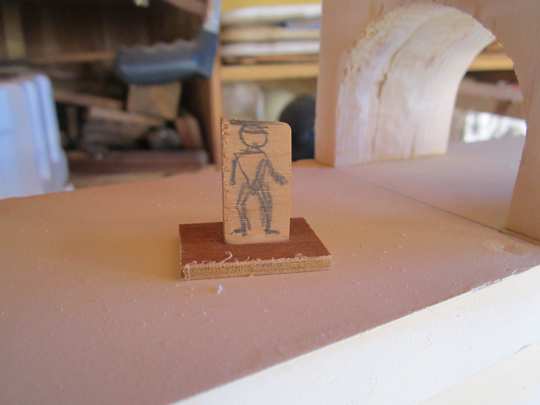 I built a tiny man to remind me of my scale. I can move him around as I work on different areas. 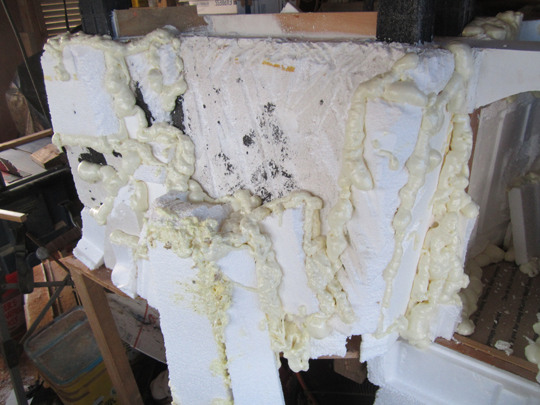 Expanding foam gap filler called Great Stuff can be used a great glue to hold pieces of foam together and also to fill cracks and holes. I built the main hall out of cardboard and paper. 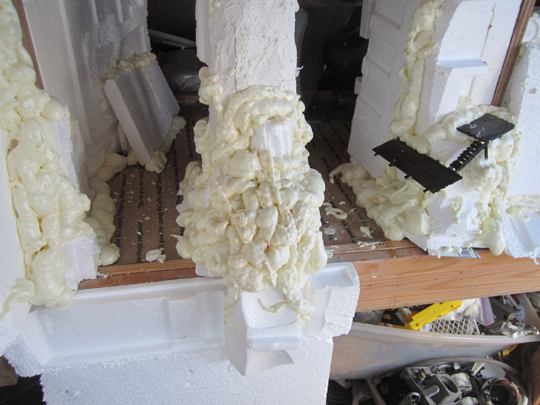 This is what the expanding foam looks like on the styrofoam. 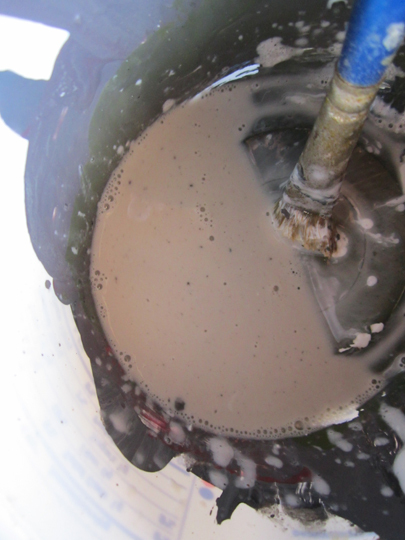 It is fun to play with, but can be very messy, like super-incredibly messy. I filled the cracks and holes. I used two cans of the foam. I had a small bridge from another project so I added it down by the water’s edge. 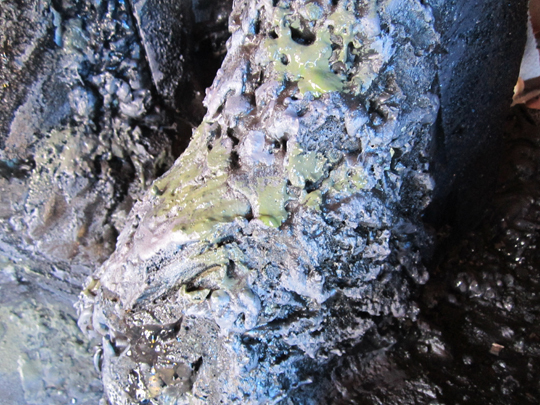 The Great Stuff expands and leaves blobs when it dries. 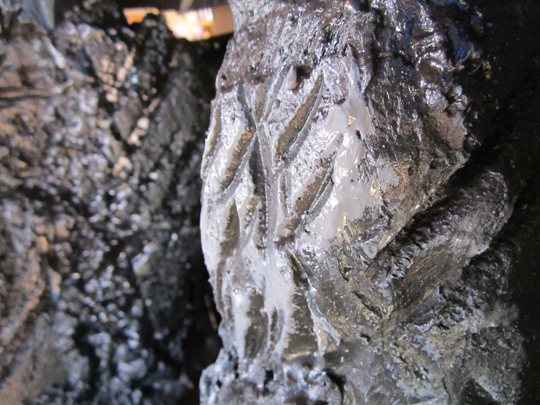 The edges are rounded so you have to cut it and shape it so it looks more like your rough rocks. Go ahead, make a huge mess, have some fun. 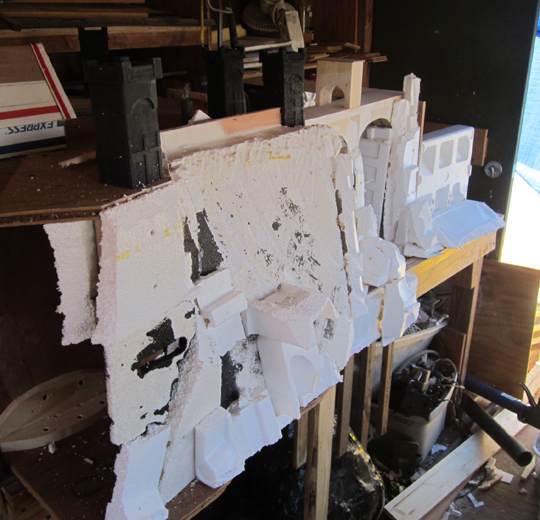 Now I began adding styrofoam. Styrofoam can be bought at the home stores for pretty cheap. A big sheet about 1″ thick is around $20 or so. It is nice and clean and flat, and I will have to go get some before this project is over, but for now I am using up some of my old scraps. 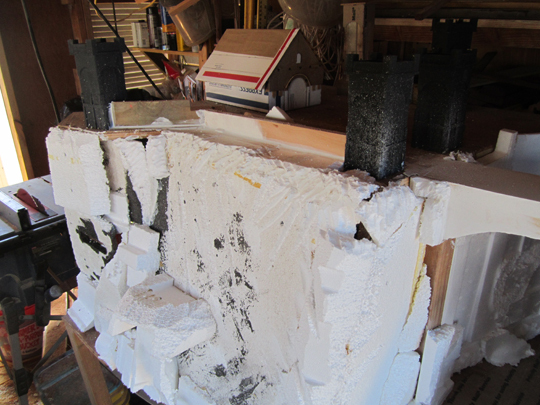 It is very easy to glue up a big chunk of thick styrofoam and just carve your mountain out of it, if you have the foam available. If you don’t, then you can use my method above. 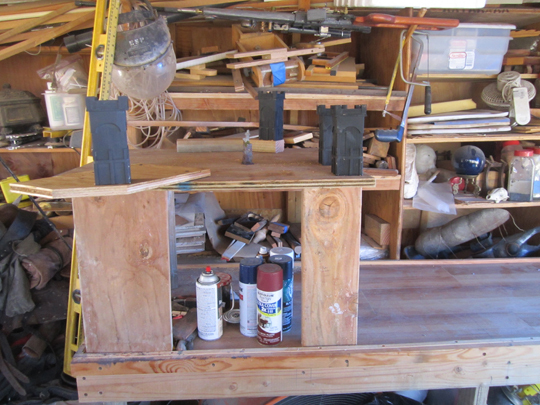 Make a sturdy under frame, and attach small scrap pieces of foam that you find free in the trash. 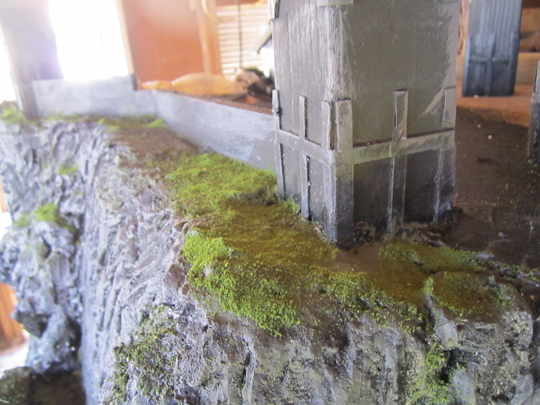 With three scrap pieces, I have the beginnings of my cliff wall. There will be multiple layers to this and multiple depths. Right now you are trying to just bulk out the major forms. Let look under the bridge arches. 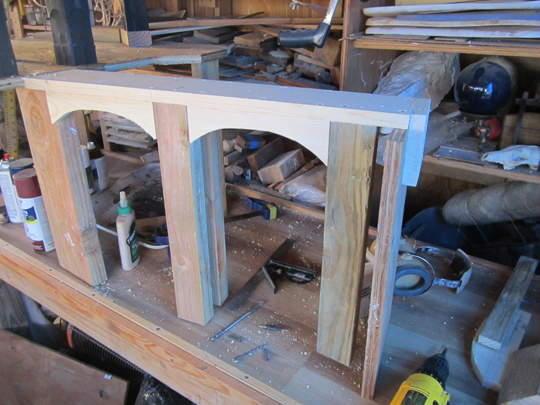 There was only two pieces of thin wood sticking down from the top to form the arches. This left a large hole between the front piece and the back piece. To fill this, I bent some cardboard, and glued it in place. 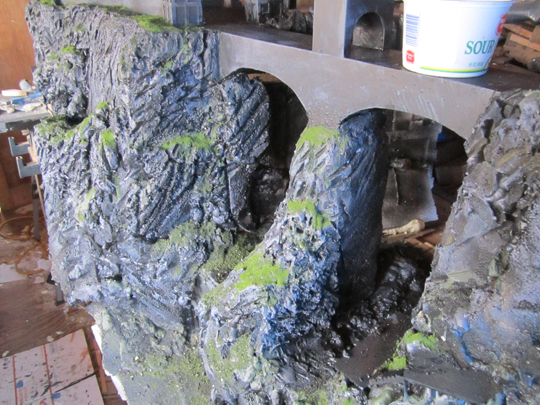 I began adding some foam around the bridge uprights for the rocks. 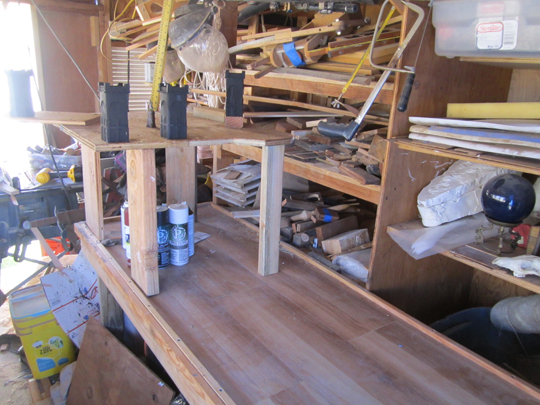 I put a piece of cardboard down on the work bench top so I could build my river bed on it without damaging the work bench top. 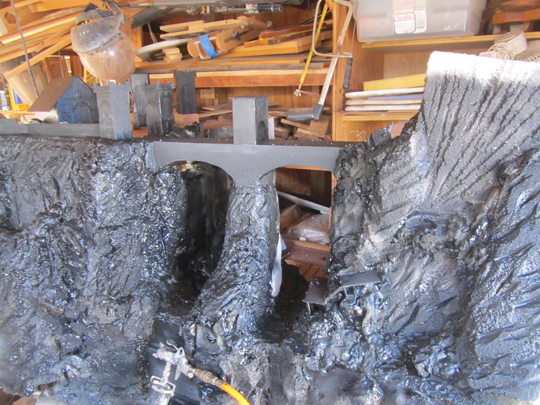 The rectangle piece of foam in the lower center is probably where the stream will water fall off the front edge of the bench. 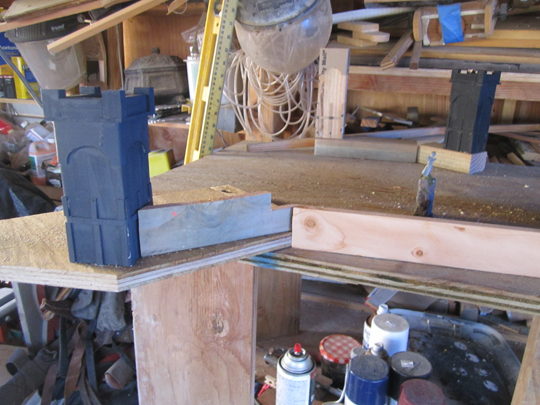 When I ran out of foam, I began working on the tower that is on the bridge. 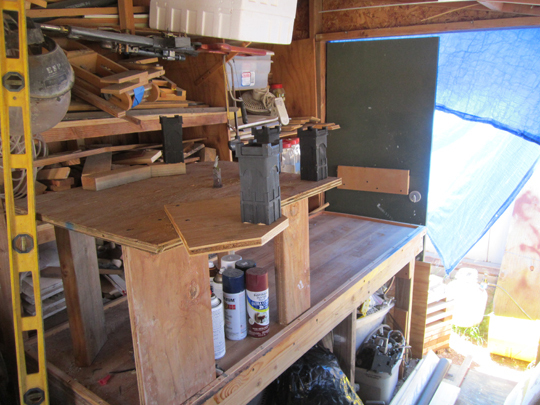 Three solid pieces of pine 3/4″ thick each, were cut out, and glued together. This will sit in the middle of the bridge. 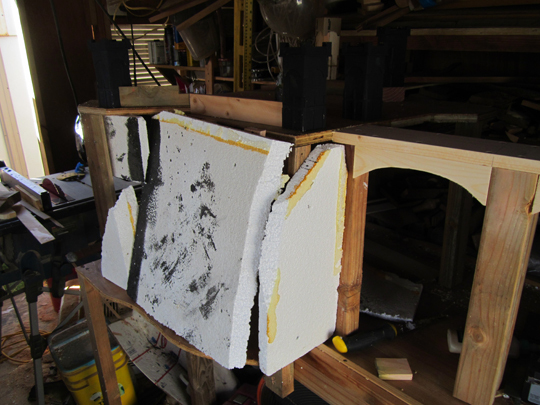 I added a few more rock pieces of foam to the bridge supports. Go get a sandwich while I run to the store for more foam. Keep adding wooden structure pieces to get your castle off the ground. This will be the castle foundation. 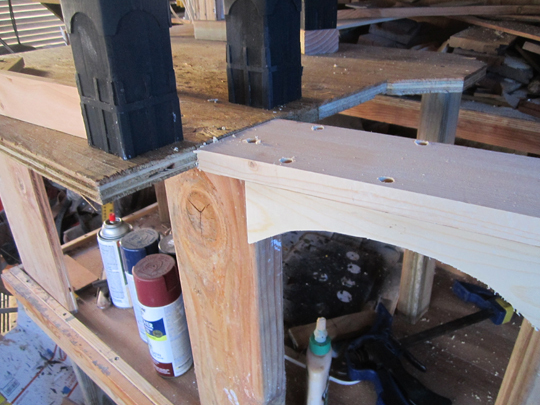 I also want some wood bracing in place to give me something to attach my styrofoam to later. This height will give me room for the bridge and rock work. 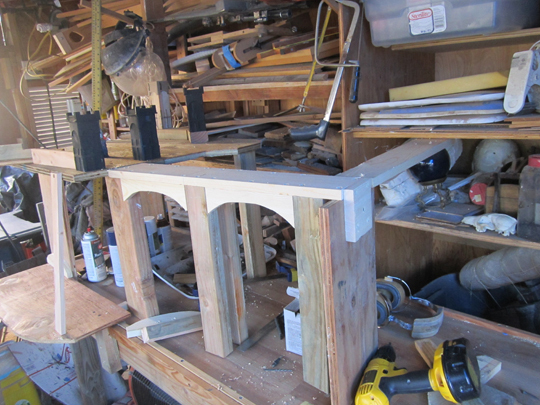 The stream under the bridge will be at the level of the work bench. So, the castle is on the far left, with all this space on the right for the bridge. Here is the first images of the bridge going in place. 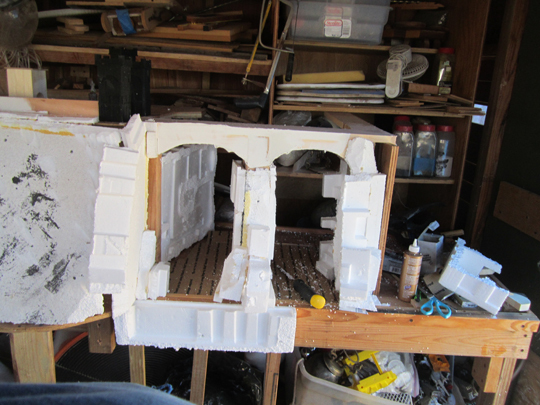 I have made bridges before out of styrofoam or paper mache and they are always delicate, and wobbly and hard to work with. 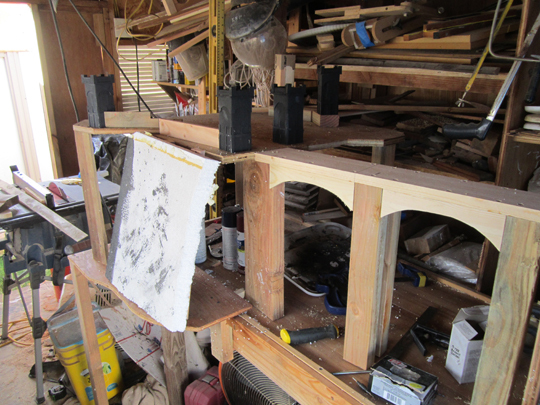 So, this time I made the base structure really solid with wood and glue and screws. I have a wood shop so this is an option for me. 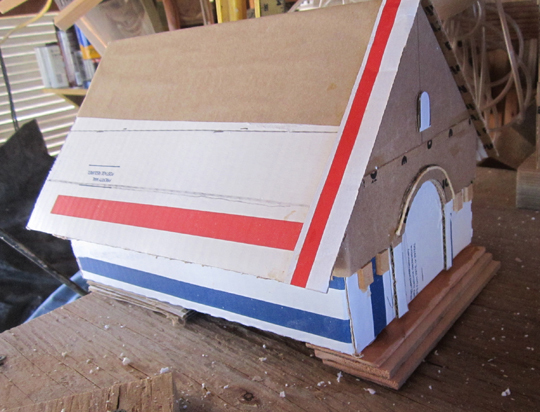 This project will be a constant back and forth between ugly structure, and delicate detail. 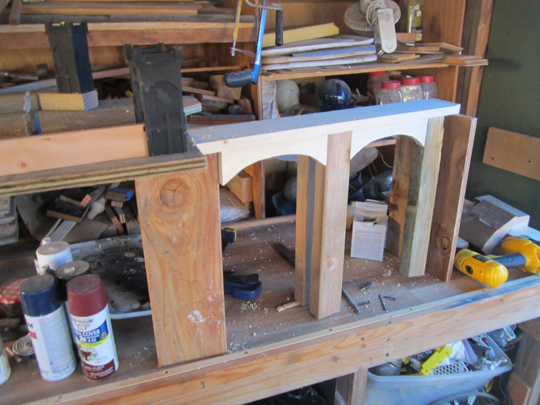 For the under neath arches, I cut a 3/4″ piece of pine to shape. 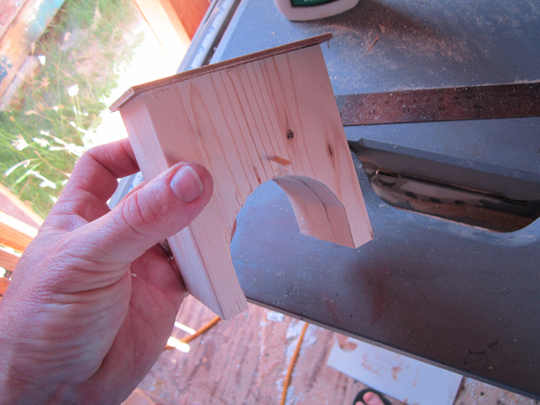 I cut four pieces like this and attached them to the underside of the bridge road. This left a hole in the middle that I will fill later. Here is the basic shape completed. I will build up the rocks later. 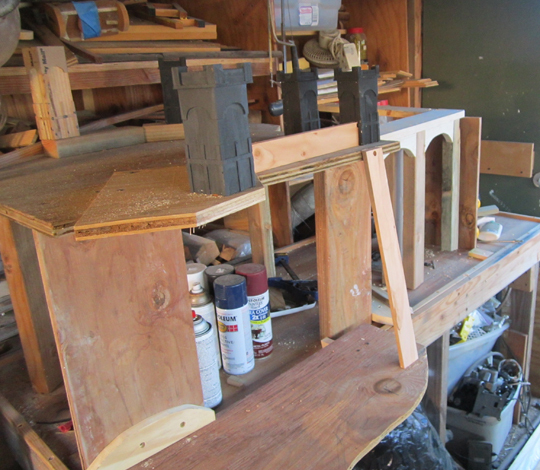 After the towers were glued in place, I began adding walls between them. I put some of the towers at different heights. You will notice the different wall heights. 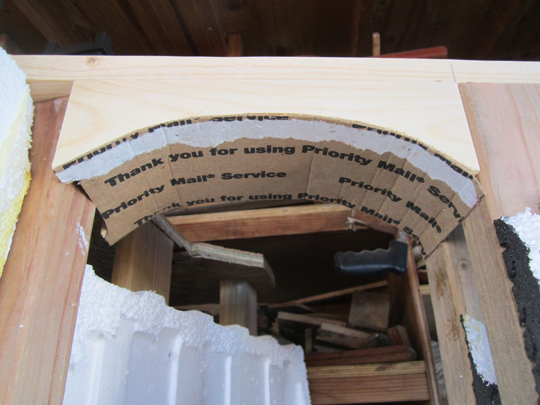 That angled piece of wood is a brace to support the styrofoam rock work later. I kept adding wood to make it sturdy. 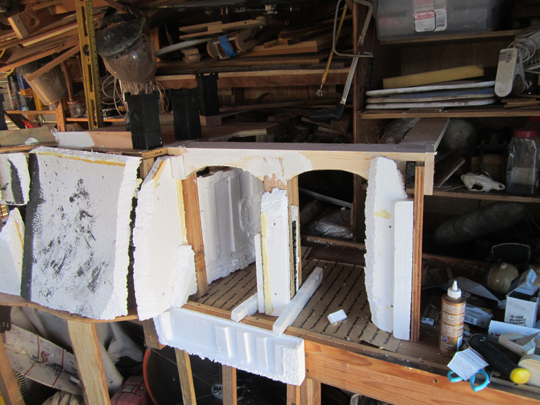 You could have also just used a huge solid block of styrofoam for all of this and skipped all the wood work, but I didn’t have a huge block of solid styrofoam. This is the last shot before I begin adding styrofoam. I needed to see how the styrofoam was going to look so I needed to begin adding some.